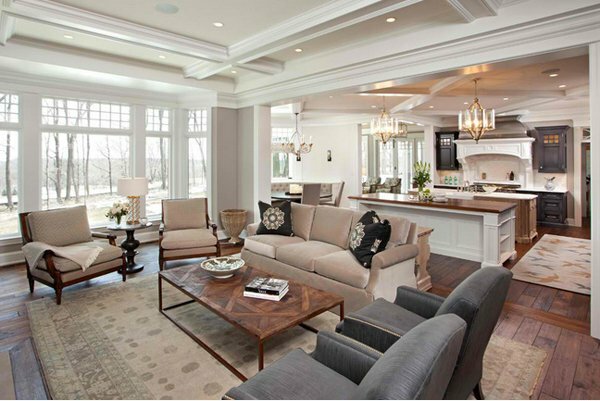 We have two previous posts about open concept living rooms, today we will be adding one to it. This time around it is traditional spaces. The lists before this are modern and contemporary ones. 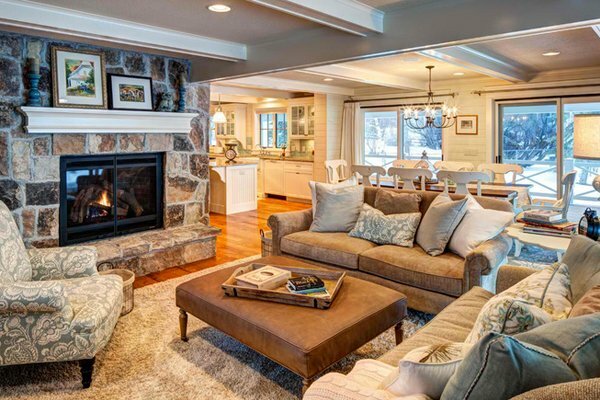 We know people loved them so we thought of collecting more photos about it – 15 Perfect Traditional Open Living Room Ideas. 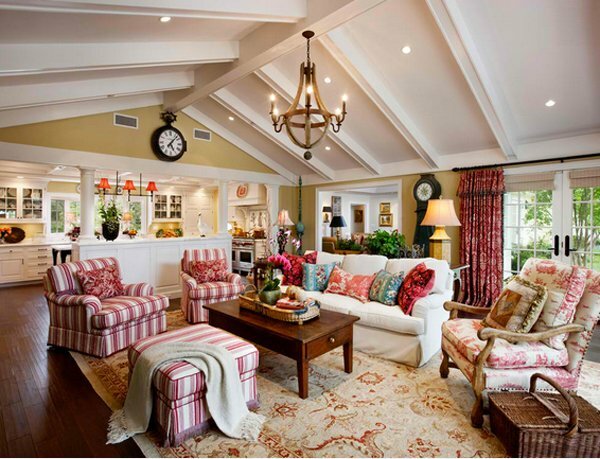 This list about 15 Perfect Traditional Open Living Room Ideas is really pretty. They come in mostly the neutral color palette and they actually have this homey yet fancy feel to them. We are betting you’d love them; why not right? Who doesn’t want to have their homes as homey as it could and is really pretty and whose designs are real close to everyone’s hearts? 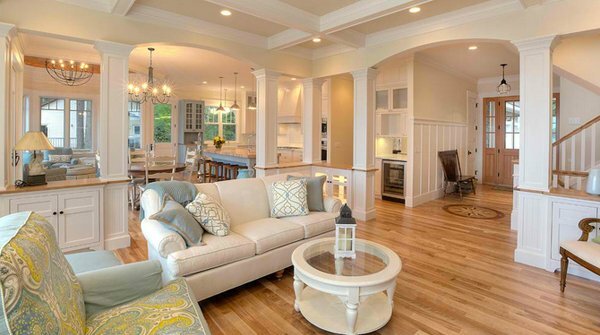 Let’s us go ahead and check out the 15 Perfect Traditional Open Living Room Ideas below. MAC Custom Homes did a great job in this stunning cottage-designed home. The colors used are clean, classic and definitely fantastic! We love the color combination of the living room set that this home has with the square ottoman that serves as the center table. 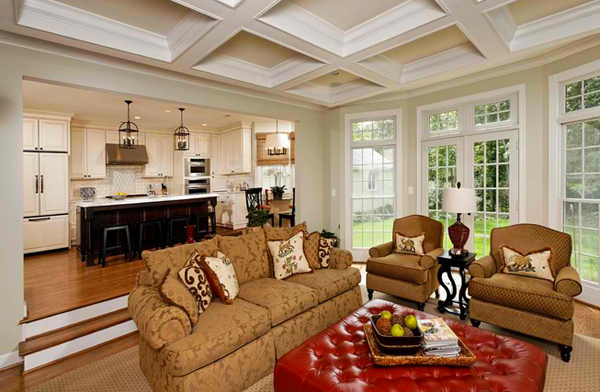 Note the beautiful coffered ceiling in this space too – it’s lovely. 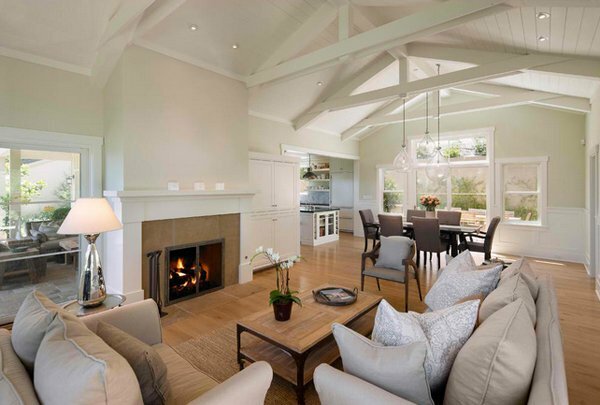 This Santa Barbara home’s open concept is superbly done with all the beams exposed which is great especially that the designers made sure the ceiling is super high to make room for proper ventilation. Minneapolis homes are really lovely; just like this home in the Hampton’s. The use of beige and greys is totally stunning! A traditional Richmond home can never look as beautiful as this space. Rinehart Custom Homes did a wonderful job on the details on the crown moldings and the wood used for the flooring. Salt Lake City has lovely homes like this. 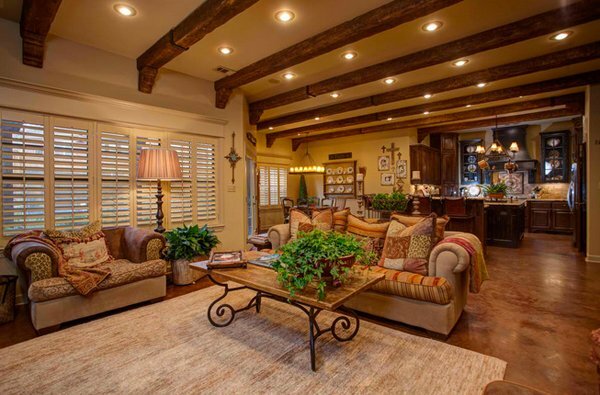 The fireplace is lovely, the flooring is fabulous, and the space is just plain gorgeous. 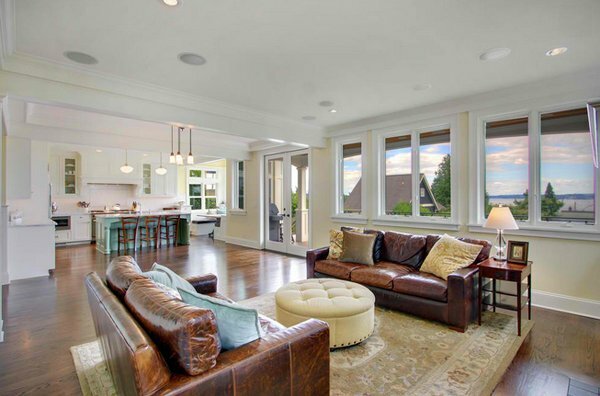 The different shades of browns used in this living room are beyond words – the color combination is a bit rustic in a way because of the colors, but the aura is just superb. Having a view of the kitchen from this space is great too. There is definitely something about Canada and why their homes are just wonderful. 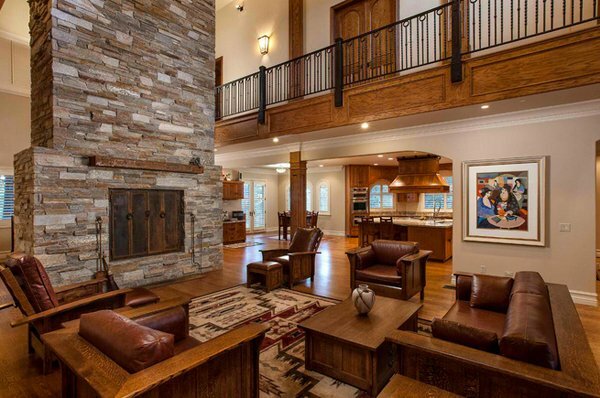 The wall treatment by the fireplace is stunning; and so is the modernized fireplace; and the wood work – its so beautiful. Great Neighborhood Homes’ work of this home was presented during the Parade of Homes Spring 2013 – it’s so wonderful. The colors are great, the decor is stunning and that awesome kitchen is beautiful. 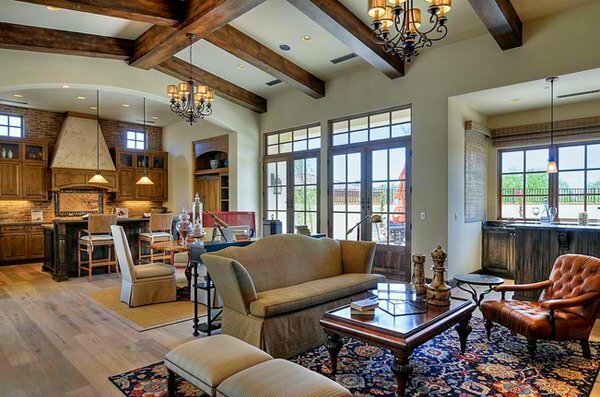 Mountain Chateau is a bit masculine because of the deep chocolate brown used in almost everything in this space. 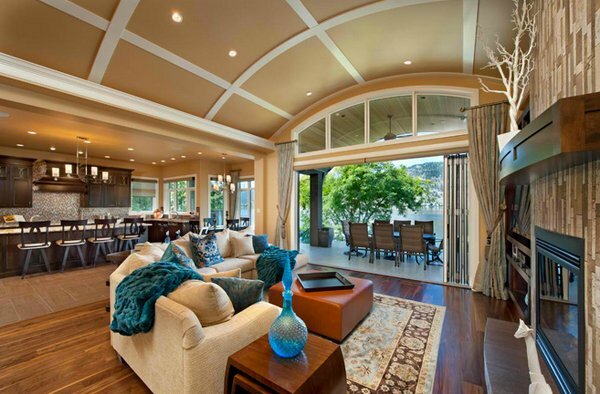 The high ceiling compensates well with the open concept this Sacramento has. Oh, New York! This classic transformation of yet another New York home from the Knight Architects is just fascinating! The open living room design is a great thing in design because it allows you to have full access to the other parts of the house. Dark colored furniture matched with a white space which not only looks good, but pretty because of the access the owners have from the living room to the kitchen and vice versa. Here is one living room which has more color than most of the pictures we have in this collection. The pinks and reds complement well with the neutrals all around the room. 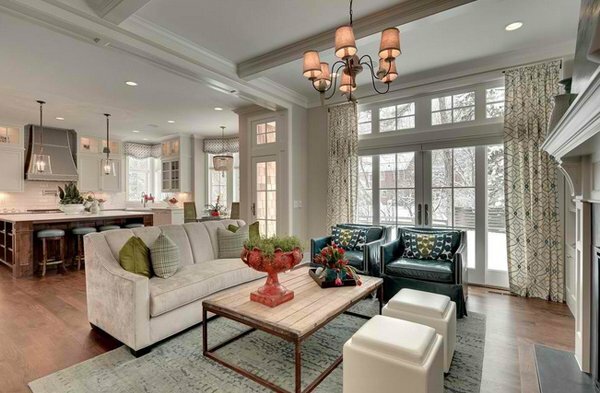 We see a beautiful open living room design in this Minneapolis home. 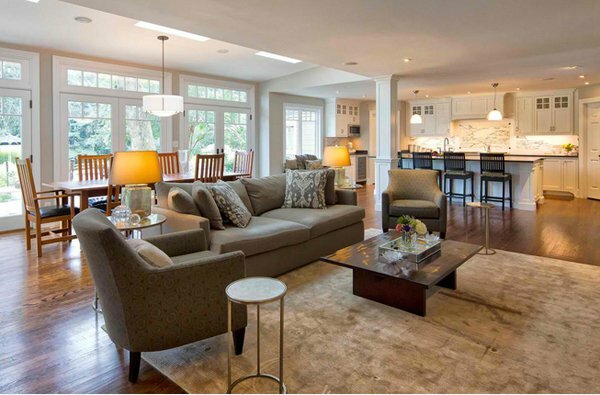 There are a few furniture but the walkways which connect the living room to the dining area and the kitchen is spacious enough for kids to run around. Phoenix has yet another home to brag about. 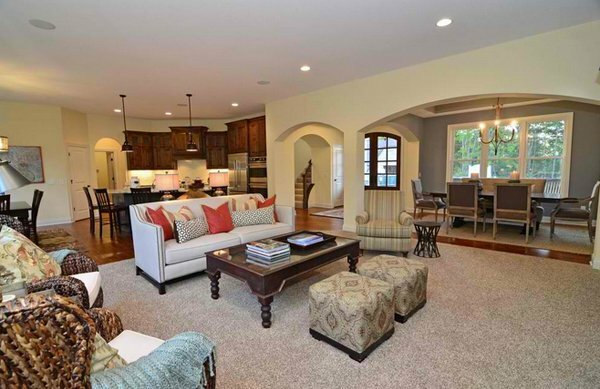 This home which was designed by Cullum Homes sure is pretty and a bit vintage. The furniture choices is great, the wood works is superb – we love it! As stunning as the living rooms in this collection is, we would like you to look back to the previous list we have about open concepts which was the 15 Homey Contemporary Open Living Room Ideas. The list was pretty useful for other home owners who actually like the open feel design for their homes that is why we came up with the 15 Perfect Traditional Open Living Room Ideas. We hope you’d like this one too – they’re stunning, homey, and very much well-loved. Happy Weekend guys!